One hundred years ago in France, Joseph Wresinski, ATD Fourth World's founder, was born in an internment camp for “undesirable” foreigners. Throughout his childhood, his heart was twisted by the shame and rage of having to go out before sunrise to earn a few pennies for his family. His mother raised him with the courage and the sense of pride of people who are too often treated with contempt. All his life, Wresinski pushed and inspired people towards a radical refusal to accept poverty. We are following in his footsteps by launching a major public campaign called “STOP POVERTY: All Together in Dignity”. The campaign's Call to Action invites all people to stand up against poverty, just as all of you do. We invite you to sign it and have it signed by others. Your passions, your successes, your experiences can inspire others. We invite you to help this inspiration to spread like wildfire by contributing to our Stories of Change series. Some have already started writing these Stories of Change, in the United Kingdom, the Philippines, the Democratic Republic of the Congo, and elsewhere. Everywhere in the world there are gems to bring to light – such as the words of Doña Maritza, an activist in Guatemala. At a Festival of Learning, she told us that she no longer felt trapped by poverty, because she no longer felt ashamed of who she was. She added that today she dares speak to others, and reach out to those even worse off than she is. 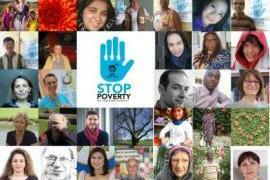 This year on 17 October, we will be observing the thirtieth anniversary of the World Day for Overcoming Poverty with all those who can join us. We are confident and proud that we are together with all of you as we continue on the path to overcoming poverty. So what do we want to do now? "As though we were wiped off the face of the earth"
"May we dare work toward Justice and Peace!"